Now that Lorrie Moore’s novel, (author - right), has made the short list for the Orange Prize, I feel compelled to talk about her novel. My No.1 Book Group, read ‘A Gate At The Stairs’ before we read Alex Miller’s ‘Lovesong’ and it struck me at the time, just how vastly different the two novels are and I was tempted to attempt an analysis of the two types of narrative, both contemporary, stunning and unforgettable. 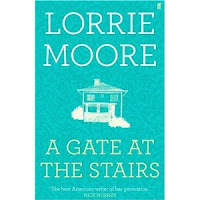 I became bogged down with this idea, and it almost became a male versus female style of writing argument and I so knew I was heading for trouble with this - so instead I will try to tell you about my No.1 Book Club’s response to ‘A Gate At The Stairs’, along with my own response. The novel is a retrospective of the coming of age of Tassie Keltjin, who, as the blurb says “with her government quietly gearing up for war in the Middle East, twenty-year-old Tassie Keltjin, a ‘half-Jewish’ farmer’s daughter from the plains of the Midwest, has come to the university town of Troy.” This novel both entertains and challenges. It is wittily observant, and yet also incisively poignant. Publicity around the novel quotes Lorrie Moore as saying the novel has a “post 9/11 aspect”, and in the announcement for the shortlist of the Orange Prize, it is described as a “wry Midwestern tale”. It is all of these things and more. It is both tragic and comedic and at times the comic pace is a little breathless for me and I felt like an outsider, suspecting that in order to get the minutiae of the barbs, you might need to be an inhabitant of the Midwest she writes of. Having said that, you can’t miss this sort of humour, when Tassie is returning home to the Midwest from Troy for Xmas. And then when Tassie is reconnecting with her old friends, who were “now like Martians to me”, she explains “Almost everyone said ‘on’ accident instead of ‘by’. They pronounced ‘milk’ to rhyme with ‘elk’ and ‘milieu’ as ‘miloo’... Or, describing her roommate... “Murph - a nose-pierced, hinky-toothed blonde from Dubuque, who used black soap and black dental floss and whose quick opinions were impressively harsh (she pronounced Dubuque ‘Du-ba-cue’)”. Tassie’s mother puts mirrors in the garden to magnify her flowers and make her gardening efforts look bigger; she is also disappointed that her husband is such a small-time potato farmer. Lorrie Moore has a real knack for nailing the eccentricities of small town America, making her characters both endearing and nutty at the same time. So, you get the flavour. But this book is far more than just cute observations of Midwest America. It is wide-sweeping in the issues it encompasses, or tries to. I’ll try to condense. Tassie finds a job as a part-time nanny. This sounds rather straightforward but in truth it is anything but. Underlying this simple job is a tragic insight into the world of fostering and adoption and the obsession of Sarah Brink, the woman she is employed by and in particular the back story of Mary- Emma whom she wishes to adopt. It is heart-rending, tender, and at times ghoulishly funny too. Sarah goes so far as to take library books out for her foster child and to bake them in the oven to make sure they are hygienic. And yet again, this particular theme , this overwhelming and intense desire of Sarah to have a child, reminded me of Alex Miller’s ‘Lovesong’ – both stories so very different and yet in this particular central theme, so very similar. In truth, the story of Tassie, Sarah and Mary-Emma was more than enough for me. But no, Lorrie Moore is not satisfied with just one central thread and instead we are taken on many divergent paths within the frame of this novel. Tassie falls in love. This appears on the surface to be the least complicated part of her life, but in the end, becomes potent with meaning linked to the political undertone of this modern post 9/11 story. Tassie’s brother Robert is your “every-lad-without-a-plan” from a small mid-western town who has no plans for university, no plans basically, and finds allure in the idea of joining the military, fighting for his country , ... or does he? You will have to read the novel to find out, but this extra layer is indeed the area that generated the most discussion. In fact, we were all very disturbed by a particular sequence of events near the end of the novel relating to Robert, which takes place in a church. To say more would be to spoil the novel. One member of my No.1 book club convinced the rest of us that this particular event did not actually take place, but was in the imagination of Tassie (and we all heaved a sigh of relief, although we didn’t believe her, and we didn’t believe the author either). We even went so far as to read this sequence out loud and decided we could only believe in it, if it was in Tassie’s imagination. Although, it is my opinion that in this, the author failed me. Of course you will have to read the novel and decide for yourself. Oh, and there is another dreadful moment in the novel which is the back story to Sarah’s obsession with adoption and this takes place on a busy motorway and involves a young child. We were all appalled and debated with great vigour and seriousness, how any mother could allow such an incident to occur. But it did. And then we set to discussing why the author needed this to be part of the story - as you can see -so many divergent threads, but they do, in the end, come together. And, if I haven’t enticed you to read this book, then simply for the stunning evocation of the misery of winter in a Midwestern town, you should. I was sunning myself in the South Island’s Golden Bay while reading this, and could feel the winter chill in my bones. Lorrie Moore is very good at describing the natural world and a sharply observant narrator of the weird, eccentric and tragic lives of ordinary people. Here is an excerpt when Sarah takes Tassie to meet the lawyer who is organising the fostering and they are discussing the birth mother and who the birth father might be. A dry quiet descended on the room like snow. This novel has received some very high praise from others, but my No.1 Book Group was more reserved in their praise. I was utterly engrossed, disturbed (oh very much) and entertained (laughed out loud), and annoyed (didn’t like the ending so much) and envious (love the clever-cloggy edgy writing). Overall, we all agreed, it is a novel to think about. 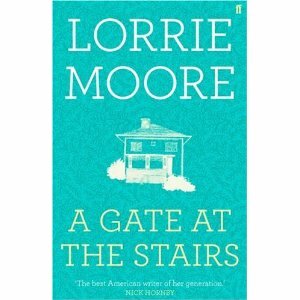 And, as for the title – well, I’m now a grandmother, and so very familiar with the idea of a “gate at the stairs”. But, you can put the gate at the top of the stairs, but as we all know, you still can’t always ensure the safety of the child. Prepare yourself for heartbreak and laughter. It is a roller-coaster ride exploring such a wide range of contemporary issues that you head will spin a little. In fact, I think it is a novel that requires a second reading.